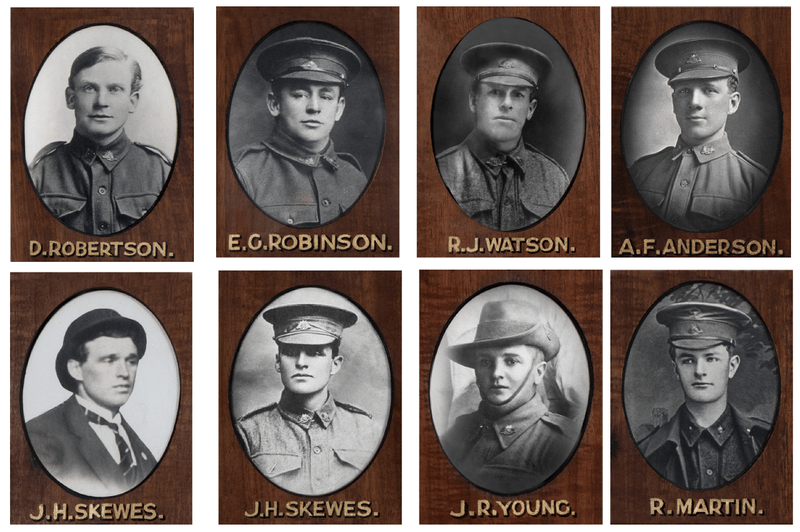 The Sons of Williamstown, A Labour of Love project set out to identify the full names and locate the service records of every man on the Williamstown Town Hall Honour Board. The men on the Williamstown Town Hall Honour Board are named using initials and surnames with occasional use of rank, for instance Capt. for Captain, Spr. for Sapper (Field Engineer/Pioneer). In most cases locating names and matching them to service records was a straightforward task. Using archival resources, including those of the National Archives of Australia, the Australian War Memorial, National Library of Australia’s TROVE and with the assistance of the community, we were able to identify nearly all of the men. We have not identified the following eight men, that is, we have yet to confirm their first names, locate records and match these men to the service records. We know that R Martin attended the North Presbyterian Church (refer to biography page R Martin) but sadly have not located his service records. Of the 265 portraits on the Williamstown Town Hall Honour Board there are two labelled J H Skewes. There is a 1919 list of ‘Names of Local Fallen Soldiers’ in the Williamstown Chronicle. This list comprises 265 names. There is one J H Skewes on the newspaper list and a G H Stanley, whose name does not appear on the board. We believe that one of the two J H Skewes photos may be G H Stanley. We would love you to contact us if you have any information on any of these men. We found in some cases the spelling of names may differ from military records to the spelling on our Honour Board. Sometimes people were known more commonly by their middle names, for instance John Leslie Bryan Baker appears as B Baker on the board. Hyphenated names occasionally caused confusion as with Archibald Ferguson-McLellan who is listed as McL A Ferguson on the board. The military used McLellan as his surname. An alias may have been used when enlisting and sometimes errors were made transposing information onto the honour board. For example C A Minett is misspelt as C A Minet on the board and W M Ferns appears as W M Ferus. We have made every effort to ensure names and details are correct and ask that you contact us if you believe an error has occurred. Below is a list where the names on the Williamstown Honour Board differ from the service records. These people are marked with an asterisk (*) on the full alphabetical list. Please refer to the individual biographies on this website for more information.